Since 2006, about 60,000 African refugees fleeing persecution in Eritrea and Sudan have come to Israel. Rather than granting them refugee status as is required by international law, Israel has been using its own laws–originally manufactured to criminalize the rightful return of Palestinian refugees–in order to detain the African refugees and deny their claims. There has been an official campaign of incitement where Israeli government officials have called the African refugees anything from “criminals” to “cancer”, and asylum seekers have been subject to mob and vigilante violence. Many of these refugees have already been deported under a policy labeled “self-deportation”. Israel has announced plans to forcibly deport the remaining 40,000 refugees to Rwanda or other African countries where they will face persecution, violence, enslavement, or death. This forced deportation is also illegal according to international law. Israel says their crime is illegally crossing the border and that they are a threat to the security of the state. However, their real “crime” is that they are not Jewish and that they are Black. Despite the high rate of status granted to asylum seekers from Eritrea and Sudan in other developed countries, Israel has processed almost none of their claims. Furthermore as non-Jews in a Jewish state these African refugees lack any other viable path to legal residency. The new policy comes under a set of amendments to Israel’s 1954 “Anti-Infiltration Law,” which has prohibited the rightful return of Palestinian refugees displaced in 1948, and has now been extended to criminalize African refugees for seeking asylum and authorize their forcible deportation. Previous amendments to the law have also allowed asylum seekers to be confined to an open internment camp, known as “Holot”, managed by the Israeli Prison Services, where they are denied rights to health care, adequate food, and basic services. All of these actions are part of a broader policy undertaken by the Israeli government to force asylum seekers to leave by making their lives miserable through tactics like anti-Black incitement, wage garnishment, and deprivation of resources. Additionally, 300,000 other undocumented workers in Israel are severely marginalized and discriminated against, but are not being subjected to these anti-Black policies and incitement. These deportations are illegal under international law according to the UN Convention Relating to the Status of Refugees, which declares that no state may expel a refugee to a territory where their life would be threatened because of race, religion, nationality, or political opinion. Though the majority of African asylum seekers come from Eritrea and Sudan, Rwanda has agreed to accept these asylum seekers in exchange for $5,000 a head (there was a previous agreement in 2013 with Uganda in exchange for Israeli arms). After being deported to Rwanda, refugees are frequently forcibly smuggled into Uganda, Libya or Sudan, where they face lack of papers, risk of violence, enslavement, or death. Israel is planning to close the detention center over the next three months and the remaining 40,000 refugees face illegal and forced deportation to third countries or imprisonment. As a signatory to the 1951 Refugee Convention, Israel should establish an effective and fair asylum process for each refugee to determine refugee status and offer protections throughout this process. Internationally, 80-90% of Sudanese and Eritrean asylum seekers are granted refugee status, whereas in Israel, less than .5% have been granted status. Israel must grant permanent or long term temporary residency and access to social services, the right to work, the right to an education, the right to services and the right to travel freely. 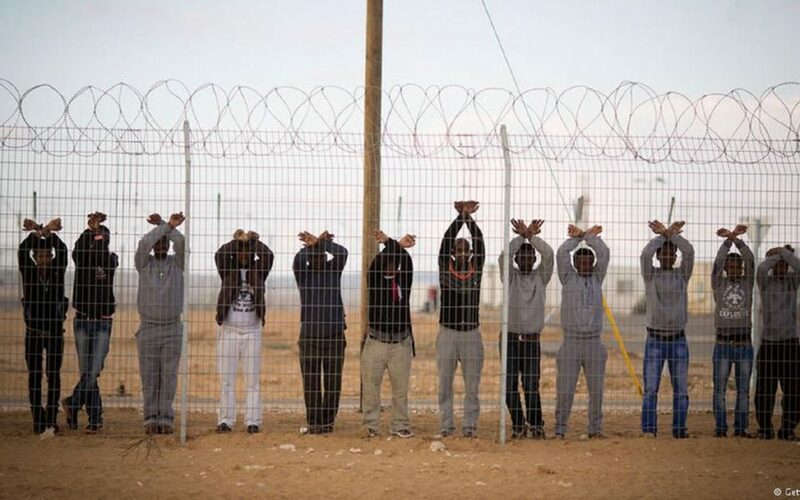 For the past decade, Israeli government officials and opinion leaders have promoted an ongoing campaign of incitement against African asylum seekers, describing them as a “cancer in our body” and “infiltrators.” The African asylum-seekers are treated as criminals and are detained in Holot detention center, where they have to participate in a daily roll calls. The promotion of these xenophobic, anti-Black stereotypes and practices have led to an unprecedented wave of hate crimes against asylum seekers, including the case of Eritrean Haftom Zarhum. >>>>> Click here to sign on here to the letter to Israeli and US officials to Stop Deportations and Grant Asylum to African Refugees In Israel.